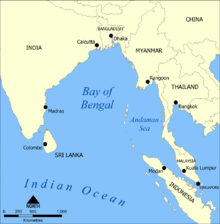 The Bangladesh Navy (Bengali: বাংলাদেশ নৌবাহিনী; Bangladesh Nou Bahini) is the naval warfare branch of the Bangladesh Armed Forces, responsible for Bangladesh's 118,813 square kilometres (45,874 sq mi) of maritime territorial area, and the defence of important harbours, military bases and economic zones. The primary role of the Bangladesh Navy is to protect the country's economic and military interests at home and abroad. The Bangladesh navy is also a front line disaster management force in Bangladesh, and participates in humanitarian missions abroad. It is a key regional player in counter terrorism efforts, and engages in global peacekeeping with the United Nations. The Bangladesh Navy was created as part of Bangladesh Forces during Bangladesh's 1971 liberation war against Pakistan. Its official creation date is July 1971 during the Bangladesh Sector Commanders Conference 1971. In 1971, with West Pakistan imposing a brutal military crackdown in East Pakistan, the Bangladesh Liberation War was already underway. Many Bengali sailors and officers in the Pakistan Navy defected to form the nascent Bangladesh Navy. Initially, there were two ships, PADMA and PALASH, and 45 navy personnel. On 9 November 1971, the first naval fleet, consisting of six small patrol vessels, was inaugurated. These ships tried to carry out raids on the Pakistani fleet, but were mistakenly hit and sunk by the Indian Air Force on 10 December 1971. The next major attack was launched on Mongla seaport. According to official figures from the Bangladesh Navy, a total of 334 sailors were involved with the newly created navy, with 22 being killed in action. The navy carried out around 45 operations during the war: traditional naval operations and unconventional commando operations including guerrilla warfare. In the first leg of the war, defecting Bengali sailors joined the guerrilla forces. It was the eight sailors who defected from the Pakistan Navy submarine PNS Mangro, under construction in France, that pioneered the formation of the naval element during the Liberation War. Later many other naval personnel participated. During the Liberation War, East Pakistan was divided into 11 sectors. Each sector had a Commander and a demarcated area of responsibility except sector 10. Sector 10 was nominally responsible for the coastal belt but actually operated over the entire country. In 1971, it was imperative for the occupation force to keep ports and harbours operative and the sea lines of communication open. The Bangladesh Navy fought to block the sea lines of communication, and to make the sea and river ports inoperative. They attacked all the seaports including many river ports. Operation Jackpot is one of the best known and most successful operations. They carried out mining in the Pasur River Channel by patrol craft. With other fighters they also carried out attacks against the Pakistan Army. As a result, Bangladesh became an independent state within the shortest possible time. After independence, especially in the 1970s, additional naval infrastructure was required. Two ex-Royal Navy frigates joined the Bangladesh Navy as BNS Umar Farooq and BNS Ali Haider in 1976 and 1978 respectively. In 1982 a third ex-Royal Navy frigate joined the BN as BNS Abu Bakar. The acquisition of these three frigates is considered the principal foundation of the Bangladesh Navy. Bangladesh Navy is the first force among Bangladeshi military services to induct female members. First batch of 14 female officers joined the navy in 2000. In 2016, 44 female soldiers were added to the force for the first time. In 2011, the Bangladesh Navy's rescue and medical team, along with the Bangladesh Army was deployed to Japan after Tōhoku earthquake and tsunami. Bangladesh Navy have been an active disaster recovery force abroad. In 2013, the navy deployed BNS Somudra Joy carrying humanitarian assistance worth of $1 million. Navy's medical team were also deployed to Philippines. The Bangladesh Navy joined in the search operation of missing Malaysia Airlines Flight 370 with BNS Bangabandhu, BNS Umar Farooq and a Dornier Do-228NG MPA in March 2014. The aircraft was a Boeing 777-200ER which gone missing with 12 Malaysian crew members and 227 passengers from 14 nations during the flight from Malaysia to China. Later, BNS Umar Farooq was replaced by BNS Somudra Joy. The search was renewed in May 2014 when an Australian exploration company claimed to have traced aircraft debris in the Bay of Bengal. In 2014, during the Water Crisis in Maldives, the Bangladesh Navy was the first to launch humanitarian aid relief by deploying BNS Somudra Joy with 100 tonnes of bottled water. In 2009, the Bangladesh government adopted a long-term modernisation plan for its armed forces called Forces Goal 2030. As of 2013, about a third of the military hardware procured under the plan has been for the navy. It procured two refurbished Type 053H2 (Jianghu III) frigates from China in 2014. Two United States Coast Guard High Endurance Cutters joined the BN in 2013 and 2015 which are being used as patrol frigates. Navy also bought an ex-Royal Navy Roebuck-class survey vessel and two ex-Royal Navy Castle-class offshore patrol vessels (OPVs) which were converted to guided missile corvettes in 2011. Two Type 056 corvettes joined the BN in 2016 while two more were ordered in July 2015 and they are under construction. Two Durjoy-class large patrol craft (LPCs) were built in China and joined the BN in 2013. Two more ships of the same class with dedicated ASW capabilities were commissioned in 2017. The Bangladesh Navy opened its aviation wing on 14 July 2011 with the induction of two AgustaWestland AW109 helicopters. Later on, two Dornier Do-228NG MPA were introduced in 2013. To attain underwater operational capabilities, the Bangladesh Navy inducted two off-the-shelf Type 035G (Ming class) submarines from China on 12 March 2017. A new base for the Bangladesh Navy, named BNS Sher-e-Bangla, is being constructed at Rabanabad in Patuakhali. It will be the largest naval base of the Bangladesh Navy with submarine berthing and aviation facilities. Meanwhile, a separate submarine base, named BNS Sheikh Hasina, is under construction at Pekua in Cox's Bazar. In 1993 the Bangladesh Navy joined United Nations Peacekeeping Operations. Its first UN mission came in 2005, when a Bangladesh Navy contingent was sent to Sudan as Force Riverine Unit (FRU). The Bangladesh Navy is currently serving in United Nations Interim Force in Lebanon (UNIFIL) in Lebanon since 2010, when two ships, BNS Osman and BNS Madhumati, were deployed there in May of that year. The BN is the third Asian and only subcontinental navy to serve in the volatile region. The BN maintained the two ships thousands of miles from Bangladesh in the Mediterranean Sea for four years until June 2014, when the ships were replaced by BNS Ali Haider and BNS Nirmul. BN ships regularly participate in exercises with other navies, gaining valuable experience and improving their fighting capabilities. CARAT is a yearly exercise conducted with the United States Navy in the Bay of Bengal since 2011. The BN has sent an OPV to every MILAN multinational naval exercise held near the Andaman Islands since 2010. AMAN, another multinational exercise held every two years in the Arab Sea, organised by the Pakistan Navy, has also seen participation by BN frigates since 2009. BNS Bangabandhu participated in Exercise Ferocious Falcon, a Multinational Crisis Management Exercise, held at Doha, Qatar in November 2012, while BNS Somudra Joy participated the same exercise in 2015. BNS Abu Bakar took part in 14th Western Pacific Naval Symposium and International Fleet Review-2014 in Qingdao, Shandong Province of China in April 2014. She also perticipated in Langkawi International Maritime and Aerospace Exhibition (LIMA)-2015 held at Malaysia. Deployment of Bangladesh Navy and Special Operation Forces. Somudro Ghurni (English: Sea Vortex) is the codename of a series of major naval exercises conducted by the Bangladesh Navy to simulate naval warfare and the protection of the country from external maritime threats, protection of the country's maritime resources, and prevention of smuggling. The exercise took place in the Bay of Bengal. It started on 16 November 2015 and lasted 15 days. During the exercise, the navy deployed most of its fleet, including frigates, corvettes, and maritime patrol aircraft. The exercise included search and rescue, logistical, maritime patrol, landing, and warfare exercises. During the exercise, the Navy successfully test launched missiles. The Executive branch is responsible for Seamanship, Navigation, Communication, Torpedo Anti Submarine, Gunnery and Hydrographic activities. The Engineering branch has responsibility on board ships and at shipyard/dockyard organizations. On board ship the Engineering branch officers and sailors maintain Ships' propulsion system, power generation system, steering gear, auxiliary, ancillary and all mechanical and hydraulic systems of the ship to keep the Ship operational, ensuring its stability, sea keeping, fire fighting and damage control capabilities. At shipyard and dockyard the Engineering branch is engaged in ship repair, ship construction including renovation and new building. They are also responsible for forecasting of machinery spares, inspection & quality control and maintaining the Depot. The supply branch is responsible for providing supply support to ships in terms of dry and fresh rations, clothing and secretarial duties. Commonly known as Electrical branch, which is responsible for distribution of power supply in the ship, maintenance of all electrical equipment, propulsion electronic control system, navigation (radar, GPS, echo sounder etc.) and communication equipment (HF sets, VHF set etc.). The major and most important part of their job is to look after the weapon and fire control system, sensors, search and fire control radars. They also contribute to the dockyards and shipyards in similar ways of the Engineering branch. The Education branch remains committed for instructional duties.Officers work in the Naval law department are also recruited for the education branch. The Education branch (Engineer) officers are mainly responsible for performing technological development of the Navy besides their service duties. They also perform research & development activities at CNRD & IFF Centre to enhance naval technological capabilities..
Doctors from Navy recruited directly and doctors from Army Medical and Dental cores are seconded to the Navy for short duration to serve in the ship/establishment and in naval hospital. The Bangladesh Naval Academy is the home of naval cadets to be the future officers of Bangladesh Navy. The academy provides education, athletic and military training to the naval cadets. The academy also offers training programs to the officers of allied navies including navy personnel from Qatar, Sri Lanka, Maldivean and Palestinian Navy. As of 2018, the Bangladeshi Navy has four Guided Missile Frigates, two patrol frigates, four Corvettes, thirty-eight minor surface combatants of various types (including patrol vessels, missile boats, and mine hunters), and thirty auxiliaries as surface assets. Submarine branch is equipped with two diesel-electric attack submarines. The naval aviation wing operates both fixed-wing aircraft and rotorcraft. The navy also maintain a special force named SWADS. Bangladesh Navy entered into submarine era with the commissioning of two refurbished Type 035G (Ming class) submarines on 12 March 2017. Diesel-electric attack submarine 2 They carry 57 personnel and 18 Torpedoes with an option of loading 32 mines as well. Corvette 4 Two Type 056-class vessels were ordered from China in 2015. Fast attack craft-missile 4 Upgraded with C-704 AShM. Minesweeper 5 Mainly used as offshore patrol vessels. Type 92 Semi-automatic pistol 9×19mm China Standard issue sidearm. Type 54 Semi-automatic pistol 7.62×25mm China In special Forces and reserve use. Type 56 Assault rifle 7.62×39mm Bangladesh Upgraded version of Ak-47. Produced under license by BOF. BD-08 Assault rifle 7.62×39mm Bangladesh Produced under license by BOF. M4A1 Assault rifle 5.56×45mm US SWADS. Daewoo K2 Assault rifle 5.56×45mm S.Korea SWADS. M24 sniper rifle sniper rifle 7.62×51mm US SWADS. BD-08 Light machine gun 7.62×39mm Bangladesh Produced under license by BOF. Bangladesh has made a long term modernisation plan for its Armed Forces named Forces Goal 2030. The plan includes the modernization and expansion of all equipment and infrastructures and providing enhanced training. Bangladesh Navy is setting up a new base at Rabanabad in Patuakhali named BNS Sher-e-Bangla, which will be the largest naval base of the country. The base will have submarine berthing and aviation facilities. A separate submarine base named BNS Sheikh Hasina, is under construction at Pekua in Cox's Bazar. Another full-fledged base, named BNS Sheikh Mujib, is under construction in Khilkhet of Dhaka. The construction works of a fleet headquarters at the Sandwip channel of Chittagong with ship berthing facilities is already going on. Bangladesh navy has ordered two Type 056 corvettes from China in July 2015 which were already launched and will be delivered in 2018. Khulna Shipyard is constructing two hydrographic research ships for the Bangladesh Navy. In January 2018, a tender has been floated for the procurement of two coastal survey boats for the navy. The boats will be built in any Bangladeshi shipyard. A tender has been issued for the supply of Technical Data Link (TDL) system. The system will connect 16 platforms as 2 frigates, 4 corvettes, 1 LPC, 3 shore stations, 2 helicopters, 2 MPAs and two submarines. BN has issued a tender for the procurement of two helicopters with anti-submarine warfare (ASW), anti-surface vessel warfare (ASuW), over-the-horizon targeting (OTHT), maritime search and rescue (MSAR), medical evacuation (MEDEVAC), casualty evacuation (CASEVAC) and special mission capabilities. The helicopters will be inducted in 2018. Contract has been signed for two maritime patrol aircraft on 27 March 2017. In July 2017, the minister responsible for defence affairs in the parliament, Mr. Anisul Huq discussed about the past, present and future development programs for the Bangladesh Navy. He told that 333 acres of land acquisition has been done in Pekua of Cox's Bazar for the construction of submarine base. Navy signed a memorandum of understanding with China for the construction of the base. Minister said that the process is going on for procuring four minesweepers and one sail training ship. Process of constructing six frigates at Chittagong Dry Dock in collaboration with foreign shipbuilders is also going on. Government has taken initiative for making missiles and Identification friend or foe system in Bangladesh. In January 2018, minister Anisul Huq reaffirms the parliament about the indigenous frigate building program and procurement of two maritime patrol aircraft and two ASW helicopters. He added that government is also procuring two new frigates, more patrol crafts, submarine rescue ship, logistic ship, ocean tug and floating dock. In April 2018, Bangladesh Navy issued tender for two X-band navigational radars with helicopter landing control facility for two of its ships. At the same time, another tender was issued for replacing two 40 mm Fast Forty guns on-board BNS Bangabandhu with new 40 mm twin-barrel gun system. BN floated a tender for the procurement of two helicopters in April 2018. The helicopters need to have anti-submarine warfare (ASW), anti-surface vessel warfare (ASuW), surface search/ EEZ surveillance, over-the-horizon targeting (OTHT), maritime interdiction and special forces operation, maritime search and rescue (MSAR), medical evacuation (MEDEVAC), casualty evacuation (CASEVAC) and transportation capabilities. ^ সশস্ত্র বাহিনীর সদস্য ২ লাখ ৪ হাজার ৫৯৬ জন. banglanews24.com. Retrieved 9 June 2017. ^ "Bangladesh's maritime boundary extends". The Financial Express. Retrieved 2 July 2015. ^ "Bangladesh Navy – Modernization". Global Security. Retrieved 15 March 2014. ^ "Navy being upgraded as a global standard force: PM". Bangladesh Sangbad Sangstha. 27 December 2011. Archived from the original on 15 March 2014. Retrieved 15 March 2014. ^ "PM: Navy to get two submarines by 2015". Dhaka Tribune. 1 March 2014. Retrieved 15 March 2014. ^ "War of Liberation, The". banglapedia.org. ^ "Bangladesh Navy in Liberation War". Bangladesh Navy. Archived from the original on 13 June 2010. ^ "History of Bangladesh Navy". Bangladesh Navy. bangladeshnavy.mil.bd. Archived from the original on 4 July 2015. Retrieved 3 July 2015. ^ "History of Bangladesh Naval Academy". Bangladesh Navy. bangladeshnavy.mil.bd. Archived from the original on 4 July 2015. Retrieved 3 July 2015. ^ "Bangladesh Navy – History". globalsecurity.org. Retrieved 3 July 2015. ^ "female officer training". Bangladesh Navy. ^ "Navy gets first batch of women sailors". The Independent. Dhaka. 31 May 2016. Retrieved 17 March 2019. ^ "Acceptance of Relief Supplies from Bangladesh". mofa.go.jp. Ministry of Foreign Affairs Japan. Retrieved 3 July 2015. ^ "BN Ship Sailed for Humanitarian Assistance to Philippines". Armed Forces Division. afd.gov.bd. Archived from the original on 4 July 2015. Retrieved 3 July 2015. ^ "Navy scouring Bay of Bengal again for MH370 after GeoResonance claim". bdnews24.com. ^ "Bangladesh sends water to aid Maldives' crisis". Daily Star. Dhaka. 7 December 2014. Retrieved 18 July 2015. ^ Hasanuzzaman, Al Masud (2016). "Civil-Military Relations". In Riaz, Ali; Sajjadur Rahman, Mohammad (eds.). Routledge Handbook of Contemporary Bangladesh. Routledge. p. 115. ISBN 978-1-317-30877-5. ^ "2 Modern Warships Commissioned". Bdnews24.com. Retrieved 31 October 2015. ^ "4 warships including Somoudra Joy commissioned". Bdnews24.com. 23 December 2013. Retrieved 18 July 2015. ^ "US hands over second naval ship to Bangladesh". navaltoday.com. 7 May 2015. Retrieved 16 August 2015. ^ "Navy to be made 3D: PM". Bdnews24.com. 5 March 2011. Retrieved 15 April 2016. ^ a b "Navy's annual exercise ends". The Daily Star. 1 December 2015. Retrieved 4 December 2015. ^ "PM arrives in Ctg". Banglanews24.com. 29 August 2013. Archived from the original on 1 October 2015. Retrieved 30 September 2015. ^ "President Hamid commissions four new naval ships". Dhaka Tribune. 8 November 2017. Retrieved 9 November 2017. ^ "Bangladesh's Submarines from China: Implications for Bay of Bengal Security". Center for International Maritime Security. 16 February 2017. Retrieved 3 April 2017. ^ "Bangladesh to give befitting reply if attacked: PM". The Daily Star. 12 March 2017. Retrieved 23 March 2017. ^ "Submarines lead Bangladesh navy into new waters". Dhaka Tribune. 12 March 2017. Retrieved 23 March 2017. ^ a b Shorwar Hossain. "Largest naval base to be in Patuakhali: PM". The Independent. Dhaka. Archived from the original on 18 October 2014. Retrieved 24 December 2014. ^ a b "Work started for land acquisition for submarine base: PM". Prime News. 12 October 2013. Archived from the original on 19 May 2014. ^ "Bangladesh Navy – Banglapedia". en.banglapedia.org. Retrieved 6 April 2016. ^ "Bangladesh Navy contributes two more battleships". The Daily Star. 8 March 2015. Retrieved 5 April 2016. ^ "Bangladesh Navy Ship in Lebanon United Nation UNIFIL ~ Bangladesh Defence". Retrieved 24 December 2014. ^ "CARAT 2013". United States Navy. ^ "Milan 2014 : An Unequivocal Success : Press Release : Indian Navy". indiannavy.nic.in. ^ "Exercise AMAN-13". Pakistan Navy. Archived from the original on 4 June 2014. ^ "BNS Bangabandhu berths at Kochi". The Hindu. 5 November 2012. Retrieved 24 May 2015. ^ "Navy ship leaves Ctg for Qatar". The News Today. Dhaka. 23 April 2015. Retrieved 18 July 2015. ^ "Naval ship Abu Bakr returns from China". BSSNews.com. Archived from the original on 23 September 2015. Retrieved 31 October 2015. ^ "BNS Abu Bakar leaves port city for LIMA-2015 in Malaysia". Dhaka Tribune.com. Retrieved 31 October 2015. ^ "ক্ষেপণাস্ত্রের সফল পরীক্ষা চালাল নৌবাহিনী" [The navy successfully test the missile]. Prothom Alo (in Bengali). 1 December 2015. Retrieved 26 June 2017. ^ "নৌবাহিনীর 'সমুদ্র ঘূর্ণি' নিয়ে সচেতনতা বিষয়ক সেমিনার" [A seminar on awareness of the 'sea vortex' of the Navy]. Bhorer Kagoj (in Bengali). 1 December 2015. Retrieved 27 December 2015. ^ "শেষ হলো নৌবাহিনীর বার্ষিক সমুদ্রমহড়া 'সমুদ্র ঘূর্ণি" [The end of the Navy's annual sea-monsoon 'sea vortex']. Daily Naya Diganta (in Bengali). 1 December 2015. Retrieved 27 December 2015. ^ "Bangladesh Navy". Bangladesh Navy. Retrieved 3 April 2017. ^ "Indian army chief meets PM Sheikh Hasina". Dhaka Tribune. 2 April 2017. Retrieved 3 April 2017. ^ a b "BN, BAF chiefs rank upgraded". Bangladesh Sangbad Sangstha. Archived from the original on 3 February 2016. Retrieved 17 January 2016. ^ "Navy to get two subs this year". The Daily Star. 20 March 2016. Retrieved 3 April 2017. ^ "CPA chairman Nizamuddin named new Navy chief". bdnews24.com. Retrieved 3 April 2017. ^ "List of ships in Bangladesh navy". ^ "Naval Aviation – Bangladesh Navy". ^ "Bangladesh's first 2 submarines commissioned". The Daily Star. 12 March 2017. Retrieved 12 March 2017. ^ "Bangladesh's first submarines commissioned". Dhaka Tribune. 12 March 2017. Retrieved 12 March 2017. ^ "Bangladesh's new C13B corvettes start sea trials ahead of more orders". IHS Janes 360. Retrieved 21 September 2015. ^ a b "World Air Forces 2017". Flightglobal Insight. 2017. Retrieved 27 February 2017. ^ a b "Bangladesh Navy's new Dornier 228 multirole aircraft will feature Leonardo AESA radars". Naval Today. 12 September 2017. ^ "Bangladesh Navy successfully test fires long range missile". The Daily Star. Retrieved 5 April 2016. ^ a b "Forces Goal 2030 to be implemented in four phases: PM". New Age. 28 February 2013. Retrieved 15 March 2014. ^ "বাংলাদেশ নৌবাহিনী বহুমাত্রিক বাহিনীতে পরিণত হয়েছে". The Daily Jugantor. 9 November 2017. Retrieved 8 November 2017. ^ "One day BD Navy to become builder from buyer, hopes PM". UNB. 24 December 2017. Retrieved 24 December 2017. ^ "Tender specifications of Jarip Boats" (PDF). DGDP. Archived from the original (PDF) on 9 January 2018. Retrieved 9 January 2018. ^ "Tender specification of Technical Data Link (TDL) system" (PDF). dgdp. Archived from the original (PDF) on 20 February 2017. Retrieved 19 February 2017. ^ "Bangladesh Navy issues new helicopter tender". IHS Janes 360. 6 December 2016. Retrieved 12 December 2016. ^ "নৌবাহিনীর জন্য হচ্ছে সাবমেরিন ঘাঁটি". The Daily Manab Zamin. 6 July 2017. Retrieved 8 July 2017. ^ "তিন বাহিনীতে যুক্ত হচ্ছে আধুনিক যুদ্ধ সরঞ্জাম". Kaler Kantho. 23 January 2018. Retrieved 24 January 2018. ^ "TENDER SPECIFICATION OF NAVIGATION RADAR WITH HELO LANDING CONTROL FACILITY" (PDF). dgdp. Archived from the original (PDF) on 3 April 2018. Retrieved 2 April 2018. ^ "TENDER SPECIFICATION REPLACEMENT OF 2 X 40 L 70 NAVAL GUN - BNS BANGABANDHU" (PDF). dgdp. Archived from the original (PDF) on 3 April 2018. Retrieved 2 April 2018. ^ "TENDER SPECIFICATION OF HELICOPTERS" (PDF). dgdp. Archived from the original (PDF) on 3 April 2018. Retrieved 2 April 2018. Wikimedia Commons has media related to Navy of Bangladesh.